Both of those roadways cross waters of McNutt Creek, but the plant leaves the wetlands undisturbed. A small part of the plant will be inside the city boundaries of Bogart. Bogart lies mostly in Oconee County but crosses into Clarke County. The part of the plant that is in Bogart also is in Oconee County. The site plan is part of the application made by the Oconee County Industrial development Authority and the Economic Development Authority of Athens-Clarke County for review as a Development of Regional Impact. A DRI review is required for a project that will have impact beyond the jurisdiction of the two counties. 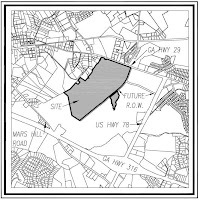 Krista Gridley, a planner in the Oconee County Planning Department, told me in a telephone conversation today that the plans submitted to the NEGRC are preliminary and could well change. She said no plans have been submitted to the Oconee County Planning Department and it isn’t even clear yet what parts of the project are going to be reviewed in Clarke County and what parts are going to be reviewed in Oconee County. She said the first documents she expects to see are ones that will subdivide the larger Orkin tract to split off the 247 acres for the Caterpillar facility. Wayne Provost, director of strategic and long-range planning for Oconee County, made the same observation about the tentative nature of plans for the plant to me by phone last Wednesday. Provost has been designated as the point person for coordination of project review for the two counties. Provost did say that the project will follow all federal and state requirements regarding protection of the wetlands on site. He said the counties will be particularly careful in that regard to avoid any delays in the project that mistakes regarding wetland protection might produce. Williams and Associates of Oconee County produced the plan submitted to NEGRC, using the name Project Roadrunner. The DRI Regional Review Notification documents states that the plant will consist of an estimated 1.2 million square feet of manufacturing and distribution space. Included are office space, storage space and a distribution center. According to the documents, no properties listed on the National Register of Historic Places are located on or adjacent to the project site. The Georgia registry of natural, archaeological and historical sites does not contain any sites on the property, the document states. The Caterpillar plant will require 65,000 gallons per day of water and generate 60,000 gallons per day of wastewater, according to the document. The plant will produce 1,178 tons of solid waste pear year when it is completed, according to the document. The plant will not produce any hazardous waste, according to the document. The NEGRC document says that Clarke County will provide the water and Oconee County will provide sewage treatment, but Oconee County Utility Department Director Chris Thomas told me those agreements have not been finalized and either county could provide water or sewer services. According to site plan produced by Williams and Associates, solid waste will be handled by private contractors. The two counties will collaborate on fire and emergency services, the NEGRC document states. 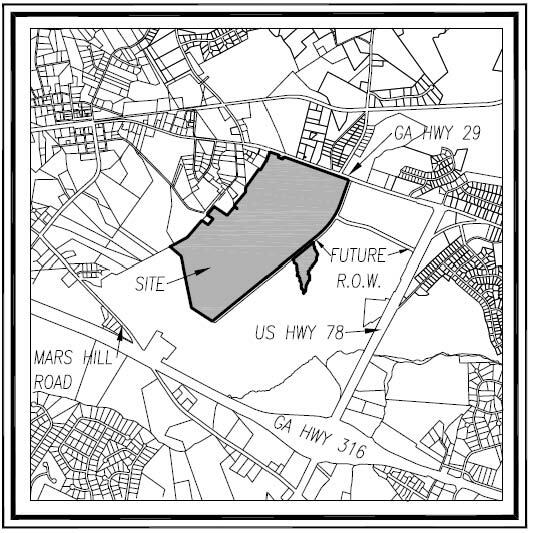 According to the plan submitted by Williams and Associates, the 247 acres consist of tax parcel 043 013 in Clarke County and a portion of 043A 024 in Clarke County and of B02 011 in Oconee County. The plan lists Southeastern Pvc Pipe Mfg., Inc., as the property owner. According to the Georgia Secretary of State corporations database, Kenneth A Orkin of Marietta is the CEO of the company. Sure are a whole lot of details here. Amazing to consider that ground-breaking is planned for next month, a testimony to the power of Caterpillar and length of planning time this project really represents. Why private and corporate enterprise will save America and not government.